A Year After Oil Spill, Tourism Bounces Back At Some Florida Beach Towns Hotels and restaurants in Florida's panhandle are reporting record spring break crowds one year after the deadly Deepwater Horizon oil rig blast and subsequent oil spill. But fishing charters and dive-boat owners say customers have been slow to return, apparently still suspicious of the water and the fishing in the Gulf of Mexico. 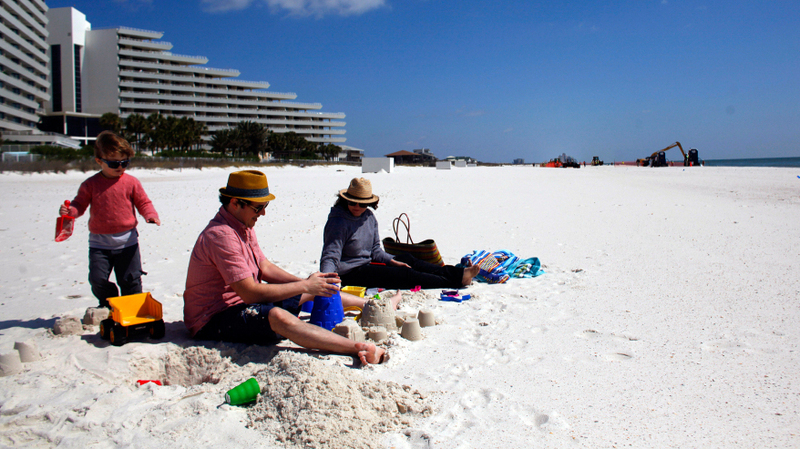 A family from New Orleans visits a beach in Pensacola, Fla., just before spring break season last month. In the distance, workers continue to clean up after the Deepwater Horizon oil spill. If it's April in Panama City, Fla., it must be spring break. Here and in other beach towns along Florida's panhandle, hotel and restaurant owners are smiling once again, a year after the Deepwater Horizon drilling-rig blast and oil spill. The crowds appear to be coming back. And that's quite a difference over last year, says Dan Rowe, the head of the Panama City Beach Convention and Visitors Bureau. "It was a very stressful summer," Rowe says. Rowe says even in the first few months after the Deepwater Horizon explosion on April 20 last year, tourism was pretty good. He recalls exactly when things changed. "It was June 18 at 11:30 at night. I know that because that's when my cellphone started ringing off the hook," he says. That's when the first tar balls were found on Panama City's pure white sugar-sand beaches. The community never saw any heavy oil or even oil sheen. Its beaches were never closed. But those tar balls changed everything. BP, which was leasing the rig, gave Florida and the other Gulf states millions of dollars in marketing money. In Panama City, Rowe's group sent out daily video of its beaches and posted updated photos on digital billboards in cities throughout the southeast. "We've never tried to hide the impacts from the oil spill because, by telling visitors and potential visitors what was going on, we felt that was important to reassure them. If they came to Panama City beach, they would understand what their vacation experience would be," Rowe says. Throughout the summer, the visitors bureau ran promotions and beach celebrations — even giving away $20,000 in gift cards. The result? Tourism dropped by 15 percent. The weather was still good and the beaches were open, but people stayed away. It's an experience that left many in Panama City a little bitter. Mike Thomas, who owns two restaurants in town and is a member of the Bay County Commission, says he's disappointed at news coverage that he feels lumped Panama City in with communities that were heavily oiled. For Panama City, the spill and the downturn in tourism came just as the community was completing a makeover — with a bevy of new hotels and condos, the Pier Park complex and a brand new $300 million airport. It was expected to be a banner year. When the spill hit, Thomas says, he was building a new restaurant. He was forced to put it on hold. 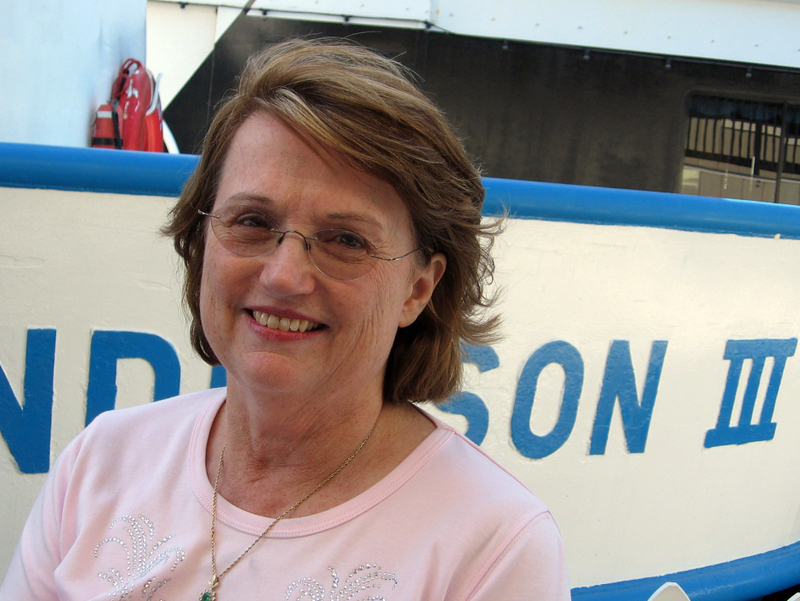 Pam Anderson, who runs a marina in Panama City, Fla., says reservations for charter and diving boats are still about a third of what they should be. "I mean, we had projected some huge increases because of the airport. And I was in the process of doubling my business. That stopped it. That hurt. That impact will be felt for a long time," Thomas says. Further west, where more oil came ashore, the impact was even greater. In Alabama, one million fewer visitors hit the beaches last year than before the spill. In Mississippi, fewer visitors meant gaming revenue at the state's 30 casinos fell by $130 million. But in all these areas, tourism officials now say, visitors appear to be coming back. At Capt. Anderson's Marina in Panama City, tourist boat cruises are attracting good crowds. But for the 25 charter boats for fishing, and three that take out divers, that also work out of the marina, business still hasn't returned, says Pam Anderson, who runs Capt. Anderson's. "Reservations are about a third of what they should be, which is not good. But I think people are watching and waiting and want to be sure there's nothing that's going to be harmful or anything. And there really isn't," Anderson says. For most of last summer, the National Oceanic and Atmospheric Administration closed deep sea fishing grounds in the Gulf. That killed the popular red snapper season and, even worse, sent a message to fishermen that there were concerns about the quality of fish in the Gulf. The fishing grounds were reopened last year. The NOAA has conducted thousands of tests of fish and shrimp and consistently reported no sign of any contamination from oil or dispersants. It's clear the seafood is safe. But, among many here, there are still questions about what the spill's long-term impact will be. Fishermen talk about the collapse of the herring fishery in Prince William Sound four years after the Exxon Valdez spill. Anderson says the fear that something like that could happen in the Gulf so far has kept her from filing her final claim with BP. "If it has affected the areas where our fish come from, and the grounds where all the original species come from that our fish feed on, then that's going to be a problem," Anderson says. 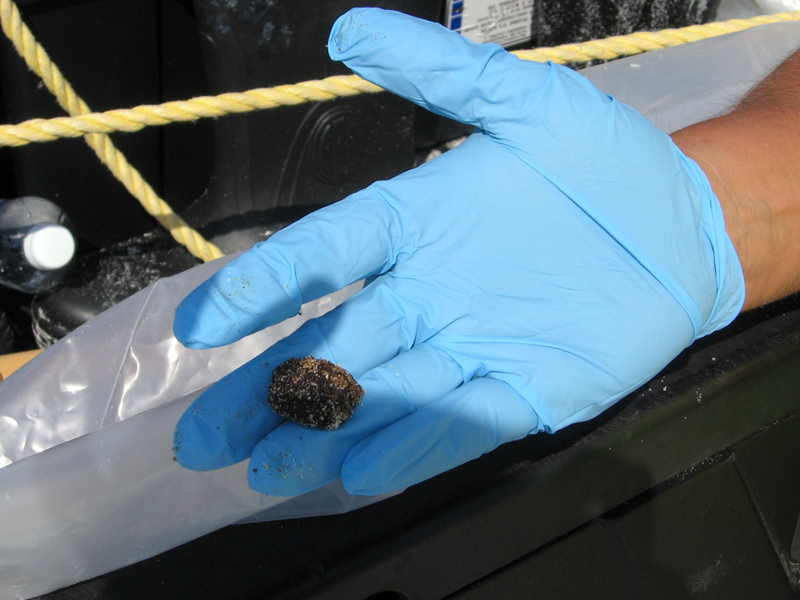 A typical tar ball picked up by BP beach cleanup teams. All along the Gulf Coast, from Louisiana to Florida, teams hired by BP still scour the beaches looking for the tar balls that continue to wash up a year later. On Pensacola Beach, people are out sunbathing, fishing and swimming. And there's another now-familiar site: Tooling along in their electric buggy, a four-man crew is searching for tar balls. On this day, after five hours of work, they've picked up a few pounds. When asked how long the crews will be on the beaches, Craig Savage with BP's gulf coast restoration group says "as long as it takes." "That's what we're trying to do, is have these teams come out here on a regular basis as they're doing — up at 5:30 and patrolling these beaches until 2, 2:30 to keep these beaches clean," Savage says. To keep the beaches clean, authorities in Pensacola, Orange Beach, Ala., and other communities along the coast say BP has to find and target the source of the tar balls. In many cases, it's turned out to be submerged tar mats — congealed oil pounded into the sand just beyond the surf line. BP recently cleaned one up on Perdido Key near Pensacola. Keith Wilkins, the director of the county's environmental department, says several others have also been identified. "It's more a nuisance, it's more of an aesthetic issue to us. And tourists could actually walk in them, they're shallow enough. We very much want to see the response agencies come in and investigate the existence of those tar mats and get them cleaned up," Wilkins says. Pensacola is on the western end of Florida's panhandle, closer to the source of the spill and an area that, unlike Panama City, saw a lot of oil. A year later though, after months of work raking and sifting sand, the beaches are back to normal. Fred Simmons, who owns the Paradise Hotel and rents cottages on Pensacola Beach, says his bookings now are triple what they were before the spill. Some of it, he concedes, is pent-up demand — people who didn't come last year. But he says you also have to credit the weather and Pensacola's beautiful beaches. "Man, look at this. It don't get any better than this. I know you're only radio, but you ought to go film that beach right now. It'd make everyone want to come here," Simmons says. Making a living from tourism or fishing along the Gulf Coast has always meant dealing with the uncertainty of weather and hurricanes. Over the past year, communities along the coast have learned man-made disasters can be just as costly and even harder to recover from.